Renthal Handle Bars and awesome renthal grips to get you those wins! Renthal handle bars - the best ?? 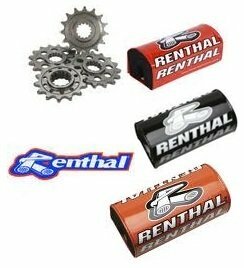 Renthal fat bars and the company history. Renthal handle bars are made in England. Honda, Kawasaki, KTM, and Suzuki all specify these handlebars as standard for performance off-road motorcycles. Formed in 1969, this company begin with handlebars crafted from aircraft grade aluminum. The performance benefit was immediately noticed with prototype models where they replaced steel handlebars. Although it took over six years to finally begin full scale production, by the 1980's it was clear that they had hit on an innovation worth taking note of. These days if you have a steel handlebar you are likely not racing to win. The change in metal that Renthal pioneered has created an improvement that cannot be ignored. 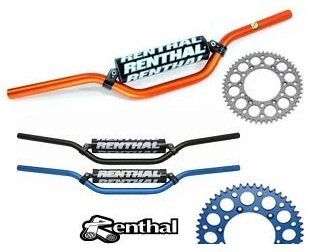 If you happen to need an easy upgrade then consider Renthal brand handlebars. Renthal since 2004, has made a number of newer types of handlebars. This includes an 7/8 inch OEM model for use on Japanese made off-road motorbikes. Even those bikes that come with steel can be fitted with these after market handle bars. Starting in 2004 every Honda CR and CRF motocross bike had the Renthal 971 “RC” bent handlebars standard. Before these handlebars were adopted most motocross bikes came with steel handlebars, which while are cheap to produce are also heavy and stiff. The 7/8 inch aluminum Renthal handle bars offer improved strength and better flexibility. Both qualities reduce the impact on the rider from vibrations and help with both material and rider fatigue. Solid grips on renthal handlebars. 2005 saw the Yamaha company move to using Renthal 7/8 inch handle bars for select models. This included the YZ, the YZ-F, and the WR ranges of off-road cycles. While Yamaha did not remain with this brand, the tact endorsement meant that by the following year nearly every other off-road motocross bike had Renthal handle bars. This includes Kawasaki, Suzuki, and KTM. While Kawaski uses the 7/8 inch standard, the Suzuki brand uses a 1 1/8 inch fatbar model as does KTM, which actually had been using these since 2002. Since then other makers have seen that to win championships you have to use the best product out there, and Renthal handle bars have become standard stock options on all off-road bikes for many of them. In 2008 Kawasaki moved to the fatbar style for its KFX450R line. Starting in 2009 this company begin making new innovations. Expanding into road racing, Renthal brand handlebars now come in adjustable clip on styles, Kevlar infused racing grips included. These clearly evolved from motocross handlebar grips, as they have open ends to allow weights and the like to be added which is a new thing for road racing. Not only can you get OEM alloy handlebars, but you can find grips and chainwheels made by this company. Renthal sprockets and other animals. Some riders today lust after full diamond grips on renthal front bars; or perhaps you’re saving up for twinwall 999 handlebars ? – well if that’s the case, you know you’ll be buying quality in any event. Even a new anodised renthal sprocket, is priced keenly at around $30 – 40 dollars, so well within most riders budgets. And possibly why, many riders & fans seek out their products. Since racing is their passion, it makes sense that Renthal continues to create exceptional products for the dirt bike racing sport. No matter if you are professional or amateur, chances are Renthal has a style of handlebar that suits your bike and the type of track you race on.